International Conference Evolution of Pension Models tоок place on 17 October 2017 in Sofia to mark the 20th anniversary of the Bulgarian Association of Supplementary Pension Security Companies /BASPSC/. - Dr. Nickolai Slavchev - BASPSC, Chief Retirement Schemes Analyst, Allianz Bulgaria Pension Company AD. Among the participants were representatives of international institutions in Bulgaria – WB, IMF, EC, Bulgarian MEPs; heads and high-ranking officials of the Bulgarian Parliament and President’s Office; ministers of the Bulgarian government; representatives of the National Social Security Institute, Financial Supervision Commission, Economic and Social Council, national trade unions and employer organizations, as well as other governmental agencies and NGOs involved in the country’s pension reform and in drafting and perfecting the pensions legislation. Naturally, the conference was also attended by representatives of all pension companies managing 2nd and 3rd pillar supplementary pension funds. The topic for the event is very relevant for us in light of the current need to draw a comparison between the development of the pension systems and models around the world and the three-pillar pension model in place in Bulgaria. Of course, the continuous debate regarding the current state of play of our social security system and the exploration of possible options for its future development and improvement also add to the relevance of the topic. 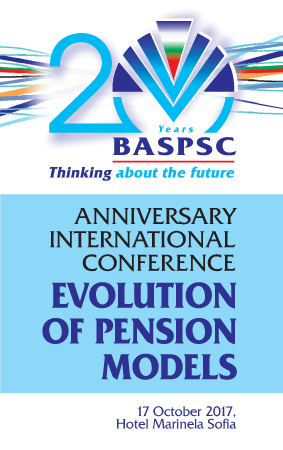 Since this conference will mark the 20th anniversary of BASPSC, we would like to point out that ever since its establishment back in 1997, the Association has represented all pension companies providing supplementary mandatory and voluntary pensions in the country, and has been an active participant in the development of the pension legislation, the introduction and functioning of the adopted pension model. As of 30.06.2017 the supplementary pension funds in Bulgaria cover more than 4.5 million members holding net assets of over 11.723 billion BGN (5.994 billion Euros). Delivered presentations can be seen here. The twelfth version of the FIAP International Seminar "Reinforcing the Foundations of the Individually-Funded Pension System to Ensure its Sustainability", coincided with the celebration of the 1st International Conference of the Peruvian Association of Private Pension Funds Administrators (AAFP). Both events were organized by the International Federation of Pension Funds Administrators (FIAP), in conjunction with the AAFP, on May 15 and 16 2014, in Cusco, Peru. The topics discussed, based on the principles of economic freedom and individual savings, aimed at identifying the mechanisms that enable underpinning the foundations of the sustainability of the individually-funded pension system. The selected topics were highly relevant internationally for the members of the individually-funded pension system, pension fund administrators and government authorities. You can download the Seminar’s program as well as the presentations given here. The eleventh version of the FIAP International Seminar "Individual Savings: Better Pensions plus Economic Development", coincided with the holding of the sixth FIAP-ASOFONDOS Congress. Both meetings were organized by the International Federation of Pension Fund Administrators (FIAP) and the Colombian Association of Severance Pay and Pension Fund Administrators (ASOFONDOS) and held on April 11 and 12, 2013, in the Hilton hotel, in Cartagena de Indias, Colombia. The purpose of the seminar was to analyze the participation and integration of the individually-funded programs in pension systems, as well as their trends and challenges for obtaining adequate replacement rates. Within this context, the impact of the creation and development of these programs on the economy of countries, growth, employment and capital market was analyzed. You can download the Seminar´s program as well as the presentations given here. International Seminar "Pension Developments in the CEE Region"
The IOPS/Pensions Europe (formerly EFRP) Seminar aimed to provide a dialogue between pension regulators and pensions industry bodies to address recent pension developments in the Central and Eastern European (CEE) region. - supervisory and pension fund views on DC risks, investment choice and defaults. A National Round Table “Funded Pension Schemes: Pay-out Period – Practical Approaches and Steps for Implementation” and an Official celebration to mark the 15th anniversary of the Bulgarian Association of Supplementary Pension Security Companies, incl. the 2012 journalist awards ceremony. Supplementary retirement provision ensures a greater and more sustainable retirement income, said Minister of Labour and Social Policy Totyu Mladenov in his address to the Round Table “Funded Pension Schemes: Pay-out Period – Practical Approaches and Steps for Implementation”. This forum opened by Minister Mladenov, was part of the events marking the 15th anniversary of the Bulgarian Association of Supplementary Pension Security Companies. Minister Mladenov stressed in his presentation that Bulgaria should keep its first pillar (public social security), while also developing and offering incentives for the second and third pillars (supplementary mandatory and voluntary retirement provision). Participation in all pillars of the pension system is an indication of the workers’ good social security culture, said the Minister. This would guarantee a larger replacement income upon retirement linked to their contribution to the social security system, Minister Mladenov added. He reminded that the current three-pillar model of the pension system was adopted back in 1998 with the full consensus of the social partners. The envisaged restrictions for early retirement remained a key goal in the transformations from 2010 and 2011. All round table participants agreed that there is no need for a radical change in the three-pillar pension model adopted in 2000. The system faces certain challenges and needs to be further developed and perfected, however, this should not give grounds for speculations and the validity of the model should not be questioned, commented Nikola Abadjiev, doctor of economics and Chair of the Managing Board of BASPSC. Apparently, in Bulgaria the achievements of our pension reform, and the established pension model in particular, are not properly recognized. In contrast, the system enjoys high recognition on behalf of the international institutions, such as the IMF, Mr. Abadjiev explained. He added that there is a huge potential in the voluntary retirement provision pillar, which may help reduce significantly the burden on the public social security system. The legitimacy of the three-pillar pension model should not be questioned, agreed the President of the trade unions confederation CTUB, Plamen Dimitrov. He stressed that some of the developments envisaged in the reform from 2000 took a negative turn and certain changes are now needed, however, many of the transformations that have been introduced or attempted recently took the wrong direction. Plamen Dimitrov voiced his support for the proposed increase of the government incentives to the supplementary voluntary pension pillar. All draft amendments to the Social Security Code regulating the pay-out period and the introduction of multifunds should be finalized by the end of January 2013, announced Angel Dzhalazov, Deputy Chair of the Financial Supervision Commission in charge of the Social Security Supervision Division. He pointed out that the Round Table discussing the benefit payments marks the beginning of the actual work on the necessary amendments in the Social Security Code. Mr. Dzhalazov added that the submission of the final draft will be followed by 3 or 4 months of discussions, which means that the whole procedure would take between 6 months and a year. The decision to have individual rather than the company-related contributions as in some European countries, proved right, because a lot of companies went bankrupt during the transition period in Bulgaria, pointed out Nikolay Slavchev, chief methodological expert in Allianz Bulgaria Pension Company, in his presentation entitled “The European Pensions Renaissance – BASPSC and the solutions of the Bulgarian pension system”. In Bulgaria we have defined contributions and not defined benefits like in other countries. These countries are only now starting to discuss a transition to defined contribution systems, he explained. In his words, the Western model is turning into a golden cage; workers are compelled to stay on the same job in order to retain their pension rights in the employer sponsored pension funds. In Bulgaria, the workers do not lose their rights when changing jobs. The EU is currently discussing namely the options to ensure the mobility of these pension rights, Slavchev pointed out. In her presentation entitled Regulation and Supervision of the Supplementary Pensions Payout Phase, Maria Hristova - Head of the Analyses and Valuation Department of the Social Security Supervision Division in FSC described the major risks during the pay-out period, namely the demographic risk (longevity), investment risk (volatility of the pension savings), inflation risk (devaluation of the retirement income) and the provider insolvency risk (failure to meet the promises). She outlined several possible approaches. First, the so-called individual savings approach – personal pension savings accounts, defined contributions, not shared demographic risk and investment risk borne by the individuals. With the group pension savings (insurance approach) there is a joint pool of savings, no individual accounts, the demographic risk is shared among the participants and the investment risk is borne by the sponsor/ the managing company. A third, combined option is also possible, she added. Georgi Todorov, CEO of CCB-Sila Pension Company and Daniela Petkova, President of the Managing Board of Doverie Pension Company focused in their presentations on the possible critical challenges during the pay-out phase for all three types of pension funds – universal, occupational and voluntary. Traditionally, at the end of each year the Bulgarian Association of Supplementary Pension Security Companies grants journalist awards. This year the awards went to two categories of media. The first category comprised the media with long traditions and consistency in providing news coverage of the supplementary retirement provision system in Bulgaria, which have contributed for many years to the development and promotion of the pension reform in the country. The jubilee awards in this category went to the newspapers Banker, Capital Daily, Insurance press, the electronic media Profit.bg and the Bulgarian National Television. Two special awards were given in the second category for 2012 – one of them for active news coverage of the retirement provision system in 2012, which went to Sega Daily, and one for a successful debut in the profound and analytical TV coverage of this topic, which was granted to the TV channel Bulgaria on Air. The International Federation of Pension Fund Administrators (FIAP) organized together with the Dominican Association of Pension Funds Administrators (ADAFP), the 2011 FIAP International Seminar Advancing in the Strengthening and Consolidation of the Individually Funded Pension Systems, was held on May 19th and 20th, 2011 in Punta Cana, Dominican Republic. The purpose of the Seminar was to analyze different topics regarding pension funds investments and the benefits granted during the decumulation stage and to present experiences and share proposals to keep on advancing in the strengthening and consolidation of the Individually Funded Pension Systems after the global financial crisis of the last years. Additionally, it was analyzed the implicit and explicit public debt generated by the pension systems, its accounting, as well as its impact on the creation and development of the individually funded pension programs in the light of the recent facts occurred in Central and Eastern Europe. As in previous occasions, international experts shared their experience and knowledge in relation to the different topics abovementioned. The seminar gathered participants from different parts of the world (members of FIAP and others), including governmental authorities, members of the Congress, officers of international bodies, representatives of pension funds administrators, mutual funds and insurance companies and other officials concerned with the social security sector. On May 6 and 7, 2010 in Vina del Mar, Chile took place the International Seminar Developing the Potential of the Individually Funded Pension Systems. The main purpose of the Seminar organized by FIAP together with the Chilean AFP Assoctiation was to identify means and instruments whereby the pension fund managers can broaden their current efforts for solving the pension problem and furthermore, extend them to other areas of interest so as to improve the quality of the population s social security protection. There was three approaches for meeting this objective. In the first place, different ways were explored in which the individually funded programs can extend their coverage to sectors of the population that are not currently engaged in pension saving or are doing so through other types of vehicles that are less appropriate for providing an effective solution to the pensions issue. Secondly, ways were explored whereby the pensions industry can take advantage of its experience and capacity for attending to other social needs of the population. Finally, organization and process alternatives that enable improving the operational management and effectiveness of the industry were analyzed. You may download the presentations made by each speaker at this Seminar here. The International Conference “MULTIFUNDS – IMPLEMENTATION AND PROSPECTS IN THE PENSION SYSTEMS OF THE CENTRAL AND EASTERN EUROPEAN COUNTRIES”, was held on 18 September 2009 in Sofia, Bulgaria. The conference was organized by BASPSC and is included in the conference calendar of the EFRP for 2009. Associations and organizations of pension funds from the CEEC countries, including members of the CEEC Forum of EFRP, members of the Sofia AD HOC group, representatives of the European commission and the World Bank, supervising institutions took part in the conference. More than 20 European countries participated in the conference. From Bulgarian side there were representatives of the legislative and executive authorities, public and non-governmental institutions, the pension funds management industry, insurers and mutual funds, academia, and other stakeholders in the social security area. The specific occasion were the rising need for discussion and exchange of information among the countries regarding the achievements and results, the preparation and practical steps for implementation of multifunds in the activity of supplementary pension security. You can view the photos from the conference here. The International Seminar “Investments and Payouts in Funded Pension Systems”, jointly organized by the International Federation of Pension Fund Administrators (FIAP) and The Polish Chamber of Pensions (Izba Gospodarcza Towarzystw Emerytalnych, IGTE), was held on May 28 and 29, 2009, in Warsaw, Poland. In the Seminar was promoted the discussion of the best practices and regulations on several issues related both to the accumulation and decumulation stages of funded pension systems. On the first day of the Seminar, several subjects related to the evaluation of the performance of pension fund investments, the analysis of new financial instruments and portfolio investment strategies for pension funds were discussed. The impact of the current financial crisis on funded pension systems also was considered. On the second day of the Seminar different issues related to the design of pension modes and the development of efficient markets for pension products were analyzed. Finally, the outlook for the Polish and European pension systems was examined. This Seminar coincided with the celebration of 10th anyversary of Polish pension funds and FIAP’s Annual Assembly. This Seminar was the seventh conference in a series initiated in 2002. As on previous occasions, more than 200 participants particpated from different parts of the world (FIAP members and others), including government authorities, members of parliament, officials from international agencies, representatives of pension fund managers, mutual funds, the insurance industry and other personalities related to the social security sphere. Conference "Private Pension Systems in the Central and Eastern European Countries"
The CEEC Forum* conference – Private Pension Systems in the Central and Eastern European Countries, took place on 24 March 2009 in Budapest, Hungary. *The CEEC Forum is the platform for the private pension funds industry in the CEE region. It brings together, under the wings of European Federation for Retirement Provision (EFRP), representatives from private pension institutions – operating both mandatory and voluntary systems from new the CEE region that over the past decade have introduced multi-pillar pension reform. You can download all presentations from the conference here. On December 12, 2007 the Bulgarian Association of Pension Security Companies celebrated its 10th anniversary at the Sheraton Hotel Balkan. This was a vivid public recognition of its activities. The jubilee ceremony was also an occasion to look back and consider the achievements in the supplementary retirement provision area during the ten-year period. In addition, the Association granted its annual journalist awards and marked the coming Christmas and New Year’s. The jubilee ceremony was attended by Minister of Labour and Social Policy Emilia Maslarova, Chairman of Labor and Social Policy Parliamentary Committee Hassan Ademov, President’s Social Policy Secretary Nikolay Nikolov, Financial Supervision Commission Chairman Apostol Apostolov, National Social Security Institute Governor Yordan Hristoskov, BNB Deputy Governor Dimiter Kostov, Deputy Minister of Finance Dimiter Ivanovski and many other institution heads and officials from the Ministry of Labor and Social Policy, Ministry of Finance, National Social Security Institute and Financial Supervision Commission, Economic and Social Council, the national trade unions and employer organizations, as well as other governmental and non-governmental institutions contributing to the implementation of the country’s pension reform, the perfection of the legal framework, and the development f the pension companies. The BASPSC chairman presented to the participants a short analysis of the achievements, developments and future trends of the Association and the pension reform in which he stated that “The establishment of BASPSC in 1997 marked an important stage in the development of the supplementary retirement provision sector in Bulgaria, because it was namely the consolidation that enabled the pensions business to participate, through its organization, in all stages of preparation and implementation of the country’s pension reform, and that played an important part in defining the strategy and goals of the reforms as well as contributing to the quality of the new relevant legislation. BASPSC and its members – the pension companies – are the ones implementing the most important and significant element of the pension reform – building and operating the second and third pillars of the pension system. Over the ten years of its existence the Association managed to establish itself as a reputable, highly regarded and respectful non-governmental organization, both domestically and internationally. BASPSC is an active participant in international pension funds organizations and forums. It is a regular member of FIAP and an observer in the EFRP. The greeting address of the Speaker of Parliament, Mr. Georgi Pirinski, was also presented to the participants. Part of it reads: “I share the understanding that the country needs a process of responsible and dedicated dialogue and continuous reforms of its pension policy that would result in adopting the best possible decisions to the best interest of the society and Bulgarian citizens. I am convinced that the Bulgarian Association of Supplementary Pension Security Companies will continue to be a competent and cooperative partner of the government in the pursuit of these goals”. „Thanks to your active involvement, the BASPSC contributed to the modernization of the Bulgarian pension model in line with the best international practices. Over the past 10 years you effortlessly passed through the stage of your institutional building and today you are among the most important partners of the Bulgarian government in the implementation of the national pension policy”, said Minister Emilia Maslarova in her speech. D-r Hassan Ademov pointed out in his greeting address: „Over the past ten years the Association’s members became a source of knowledge, economic success and public authority. Your efforts contributed to the broad acceptance of our social security model in the Bulgarian society”. As part of the jubilee ceremony, BASPSC granted its traditional annual journalist awards. Four journalists from national printed media and an electronic media – the Bulgarian National Television- received the awards for their active coverage in 2007 of the achievements, issues and trends in the Bulgarian supplementary retirement provision sector. The International Conference “Funded Systems: Their Role in Solving the Pension Problem” took place on May 31st and June 1st, 2007 in Varna, Bulgaria. The Conference was jointly organized by the International Federation of Pension Funds Administrators (FIAP) and the Bulgarian Association of Supplementary Pension Security Companies (BASPSC). The Conference was under the aegis of the President of the Republic of Bulgaria Mr. Georgi Parvanov. More than 300 participants from Bulgaria and other 40 countries from all over the world (members and non-members of FIAP) took part in the Conference. The participants had the opportunity to contact and exchange their views with representatives of the legislative and executive authorities, international organizations and banking institutions, public and non-governmental institutions, national and international organizations, pension and investment funds, the pension funds management industry, insurers and mutual funds, academia, and other stakeholders in the social security area. A National Training Event on social security systems co-ordination was held in Sofia within the framework of the Joint CARDS Program (Social Institutions Support Program) between the European Commission and the Council of Europe to support social institutions in South East Europe. The aim of the training was to acquaint the participants with the European Co-ordination Law and procedural requirements in three areas of social security – pensions, unemployment and health care , as well as to give an overview on the new Regulations 883. Prominent experts in European social security matters gave lectures during the event: Mr. Sixto Molina from the Council of Europe, Professor Francis Kessler from the University of Paris 1 Pantheon-Sorbonne and Mr. Bruno de Pauw from the National Office for Social Security, Belgium. Representatives of all pension security companies took part in the training. The introduction of the EU Directives in the pension security area to a great extent is not related with the existing regulatory framework stipulating the activities of the pension funds in the countries of Central and Eastern Europe.